These look great! I never get sick of pumpkin 🙂 What a great idea to hide the kiss. Thanks Laura, I don’t get sick of pumpkin either. That’s like saying you get sick of chocolate, hehe!! I’m a gonna be posting pumpkin for weeks still!!! 🙂 LOVE these! Yeah, ditto! Gotta share the pumpkin goodies! Wow these desserts look awesome! We are doing lots of desserts with pumpkin too! The nice thing about it is the pumpkin isn’t too sweet! As much as I am so ready for mint, I still have pumpkin recipes to share. Hopefully everyone else is still wanting pumpkin even though I have moved on. 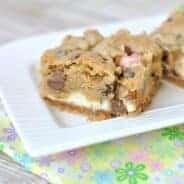 I like brownies and blondies…it is hard to choose a favorite…it all depends on my mood and the day. Love the pumpkin kiss center! You only need 16 kisses for this recipe! Sounds like it’s meant to be. And not one can of pumpkin yet? I think I’ve seriously opened at least 16 cans….no joke. Pumpkin all the way babbby! And of course we better get on peppermint now too!! 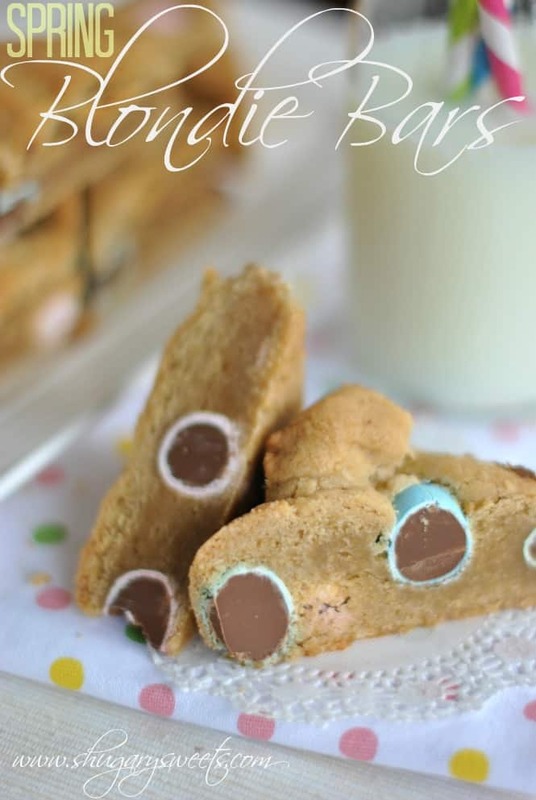 These blondies look great and I totally enjoy the bumps from the kisses!! I can never get sick of pumpkin! Never enough. 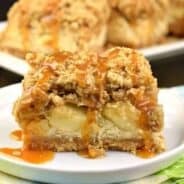 I think in my 3 months of blogging, I’ve done at least 10 pumpkin recipes. Oops! 😉 These look delicious! Such a food flavor combination! I think you’re safe to keep on with it for a good long while! I remember last year seeing pumpkin until well after Thanksgiving and into Dec! Funny, pumpkin used to mean a Thanksgiving food, something to eat in Nov. Now, it means something to start baking with in like July 🙂 Pinned! Thanks for pinning Averie. I know last year I shared a couple pumpkin recipes in January!! I am definitely not done with pumpkin! Love this! Glad to hear it Nancy…I’m so not done either! Keep posting the pumpkin recipes! All your recipes are drool worthy. I am most definitely not sick of pumpkin, and these look fantastic! There can never be too much pumpkin. 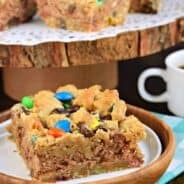 Love the extra flavors in these blondies. 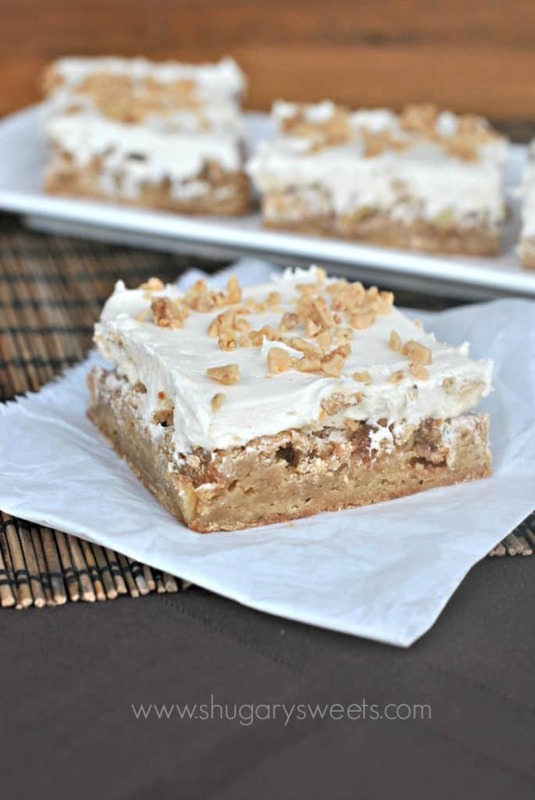 OK…I was going to make another batch of pumpkin pie bars, when I see these and totally have a change of plans. But where in the heck do you get pumpkin pie spice Hershey’s Kisses? I don’t think I’ve been living under a rock, but I have never run across them. Any ideas of what to use in their place if I can’t find them? Keep the pumpkin recipes coming, please! I can’t get enough! Sick of pumpkin? Never! These look fabulous! 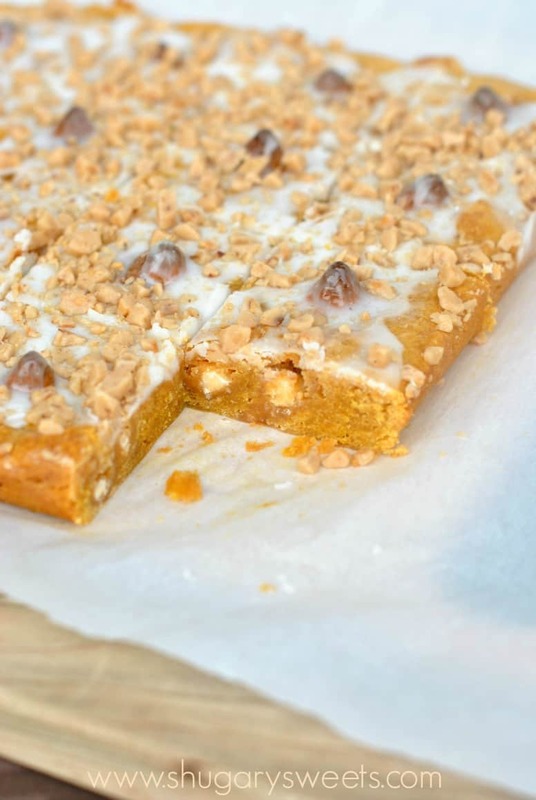 Pumpkin Blondies. Day = Made. Love the kissses and how moist these look! No need to apologize! 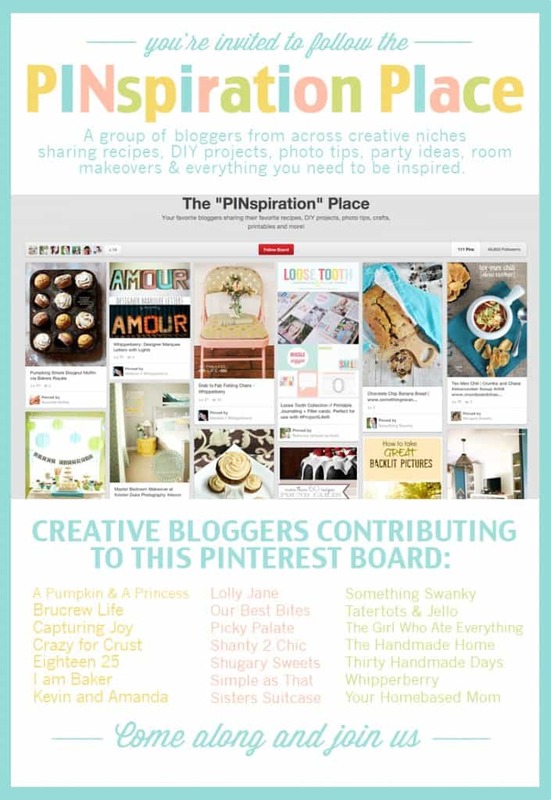 I thought I posted my last pumpkin recipe….and then i noticed my plans for November :O my bad. 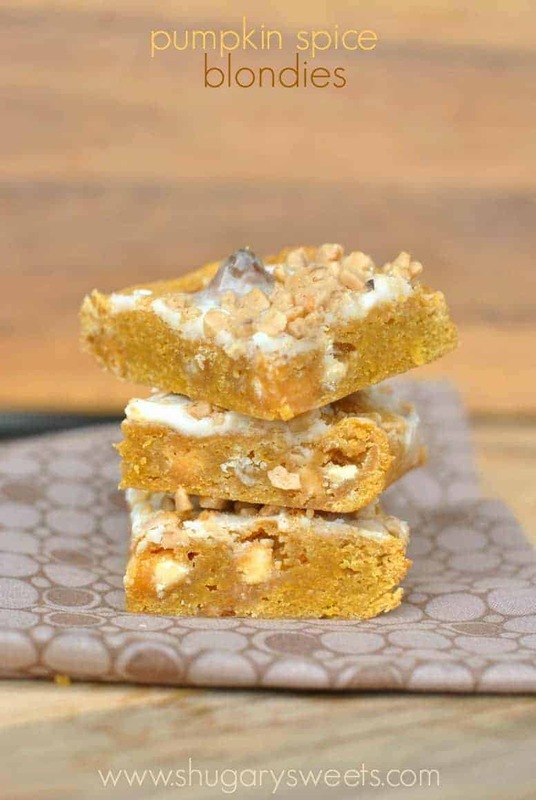 But who could say no to pumpkin blondies stuffed/topped with toffee and white chocolate?! BRING ON THE PUMPKIN!! I am sick of pumpkin but these look too good to turn down! 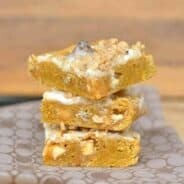 I’ve never heard of pumpkin blondies before – these look awesome! I love how simple this recipe is, too. These look so good, Aimee! What a fun and delicious fall treat! I’ll never be sick of pumpkin….EVER…especially with all of this deliciousness! I just love blondies, too! I love stumbling across all of these fantastic pumpkin desserts! These look AHHH-MAZING! Oh I love how you added the pumpkin kiss on top 🙂 the perfect touch to these beauties!